Token non-magnetic chip resistor (HM) series, applied to the field of medical high magnetic fields, such as electronic circuits located in magnetic resonance (MRI) and computed tomography (CT), or in the extreme environment of oil and gas industries, such as downhole instruments for oil wells, or flight control in aerospace applications. (HI80) family of high-voltage resistors includes conventional high-voltage resistors (HI80D), high-power high-voltage resistors (HI80P), and ultra-precision high-voltage resistors (HI80T). The Cylindrical (HI80M) divider features with voltage handling capability of up to 80 KVdc and has an operating temperature range of -55°C to +125°C, wide resistance range 2MΩ to 1GΩ with Resistive Ratio R2/(R1+R2) 1:1000 to 1:20000, and power up to 41W. This unique process has a specific resistance value in three sizes, HI82-30, HI82-40, and HI82-50. Resistance range from 1MΩ to 10TΩ, precision tolerance is 0.25% to 30% available, and the temperature coefficient is 25ppm to 1000ppm. The planar thick film divider resistor (HI83) provides stable performance over a wide range of resistance values with a voltage rating up to 35KV. The maximum resistance ratio is 1000: 1 (ratio greater than 1000: 1, such as 2000: 1, 4000: 1, and 5000: 1 is available on request) with a minimum resistance ratio of 40: 1. The RI85 Power High Voltage Resistor uses Token's proprietary thick film metal glaze resistive element and Serpentine Pattern Design which provides ideal cost efficient, stability, high power and high voltage characteristics for a wide range of measurement, voltage divider circuits, and control functions in high voltage power electronics applications. By applying this technology to the low-profile Network High Voltage Divider, single-in-line package configuration, the Type (NTK) Custom SIP Resistor Voltage Divider Networks are available with a combination of features. which include: Low TCR 250 ppm/°C (100 ppm/°C or tighter upon request), operating temperature range -55°C ~ +125°C (higher temperature upon request), flat style, non-inductive, low noise, and also custom divider design. The High Voltage RI82 Precision Resistor use Token's proprietary thick film Metal Glaze resistive element and Serpentine Pattern Design which provides ideal cost efficient, stability, precision, non-Inductive, and high voltage characteristics for a wide range of measurement, voltage divider circuits, and control functions in high voltage power electronics applications. Token's RMCA, RMCB Ceramic Composition Resistor now offers the industry a direct replacement carbon composition resistor based on a bulk resistive element comprising carbon in a ceramic filler. Due to the need for higher peak voltages, the RMCA, RMCB range is perfect for vehicle ignition system applications. Following market demands, Token Electronics provided an extent of Bulk Ceramic Composition RMCA, RMCB Series to RMCC axail lead Metal Ceramic Resistor. The cap and lead assemblies are pressed onto the RMCC resistor core, finishing the resistor and providing rugged terminal attachment. Anti-Surge Pulse Load Resistor RCR series is made by metal glaze coating on the surface of a cylindrical substrate with excellent characteristics and stable at even high resistance range. This Ceramic Tubular Resistor RMCD offer higher average power dissipation while retaining the advantages of high surge energy, high voltage withstand, and non-inductance. It is especially useful in RF applications such as transmitters and modulators, where the tube configuration provides more effective convection cooling. RY31A high voltage high frequency Resistor, with the inner and outer surfaces coated with a special glass, features higher thermal resistance oxide film and larger electric power capacity for the compact volume. Unlike conventional wire wound type, the volumetric resistance will provide superior stability versus frequency and excellent durability against transient voltage. RY31A is suitable for the application with large current as well as high frequency circuit. The RH1 Hermetic Hi-Meg Resistor is disclosed as being encapsulated in a glass tube, the enclosure being hermetically sealed to conductive caps mounted on the resistor ends. The metal glaze film of the resistance path of the resistor is protected from thermal damage during heat sealing by spacing the resistance path from the conductive caps and providing an electrical path there between in the form of an extended termination. 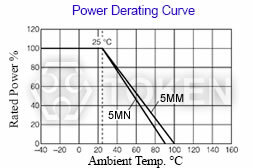 The curve that describes the relationship between the resistors’s operating temperature and the maximum value of continuous power permitted at that temperature. If the circuit designs permits, the choice of a high ohmic value resistor or divider network will minimize this consideration and improve the resistor's performance because it will operate at lower power. The maximum nominal resistance value at which the rated power can be applied continuously without exceeding the maximum working voltage is the critical resistance value. The rated voltage is equal to the maximum working voltage in the critical resistance value. If the circuit designs permits, the choice of a high ohmic value resistor or divider network will eliminate this consideration. A cermet resistive element is made from a mixture of glass and metal oxides. The metal oxide is typically RuO2 or an AgPt alloy. Applying cermet materials to a flat or cylindrical substrate, and then firing them at 850°C produce thick Film resistors. In the electronic industry cermet material is typically called Thick Film paste or ink. Resistive noise can have a devastating effect on low-level signals, charge amplifiers, high gain amplifiers, and other applications sensitive to noise. The best approach is to use resistor types with low or minimal noise in applications that are sensitive to noise. Because of their construction and manufacturing processes. The maximum voltage applied continuously to a resistor at the rated ambient temperature. Rated voltage is calculated from the following formula, but it must not exceed the maximum working voltage. Equation: Rated Voltage (V) = (Rated Power (W) × Nominal Resistance Value (Ω))1/2. High voltage resistors often are potted or operated in oil as the arc over voltage, in air, is approximately 10,000 volts per inch. Token's resistors feature higher voltage ratings due to their high square count and associated design characteristics. Rated power is the maximum value of power (watts), which can be continuously applied to a resistor at a rated ambient temperature. The basic mathematical relationship is Equation: Power (watts) = (Current (Amps))2 × Resistance (Ohms). The maximum voltage applied continuously to a resistor or a resistor element. The maximum value of the applicable voltage is the rated voltage at the critical resistance value or lower. If the circuit designs permits, the choice of a high ohmic value resistor or divider network will improve the resistor's performance because it will operate at lower power. Resistor Tolerance is expressed as the deviation from nominal value in percent and is measured at 25°C only with no appreciable load applied. A resistors value will also change with applied voltage (VCR) and temperature (TCR). For networks, absolute resistor tolerance refers to the overall tolerance of the network. Ratio tolerance refers to the relationship of each resistor to the others. It is often practical to specify tight ratio tolerances and loose absolute tolerances. How to cost effective complete select high voltage resistors? Token high voltage series can be specified for use in industrial and general purpose high voltage systems, as well as a complete selection of high resistance, Hi-Meg, high-voltage, high frequency, and bulk ceramic resistors for higher average power dissipation. These High Resistance, High Frequency, High Resistance resistors combine the proven performance of Token resistance system with new cost efficient design elements and high voltage applications. Resistors produced from Serpentine Pattern Screen Printing Design or bulk ceramic materials have displayed several key advantages in demanding high-voltage situations, including both continuous-wave and pulse applications. These include radar and broadcast transmitters, x-ray systems, defibrillators, lasers, and high-voltage semiconductor process equipment applications, where resistors must handle peak voltage anywhere from 8KV to 75KV. Typical applications include current limit in capacitor charge/discharge, crowbar, and tube-arc circuits. In these uses, bulk ceramic resistors provide low inductance, high average power per unit size, stability at high voltage, and durability at extreme peak-power levels. Film resistors typically cannot withstand high-voltage pulse applications. Token Non-Inductive Voltage Resistors are used extensively for high-frequency RF loads in broadcast and communication equipment because of their non-inductive characteristics. They provide excellent non-inductive power-handling capacity at frequencies upto the gigahertz range, with no sacrifice in power dissipation. Film resistors may provide the needed non-inductive characteristics required by such RF applications, but they have size limitations and present reliability problems due to potential film burnout. This is especially true in advanced digital applications such as digital radio and TV transmitters involving pulses at high frequencies. Due to the high voltage which can appear between the end cap and any adjacent metal part, resistors should be mounted at an adequate distance from other conductors. An appropriate number of resistors may be screwed together as a stick to provide an assembly which will be capable to withstanding any desired voltage, providing no individual resistor is subject to a greater stress or power dissipation than is recommended in its data sheet, and that appropriate anticorona devices are fitted. The axial termination should not be bent closer than twice the diameter of the terminal wire from the body of the resistor. When resistors are required to be potted, the preferred encapsulant is a silicone compound. For some high voltage applications it is required to immerse the components in oil or gas to reduce the effects of corona and surface tracking. A special lacquer protected version of the resistor is available, suitable for immersion in transformer oil or SF6. Download General Info. of High Voltage Resistorsin PDF file. Download Entire High Voltage Resistor Catalogue in PDF file.